The ALL NEW Robalo R160 packs quality, performance, style and features and is certainly the perfect capable boat for first time boat buyers or salty dogs that want a quality compact rig or Rotto tender. 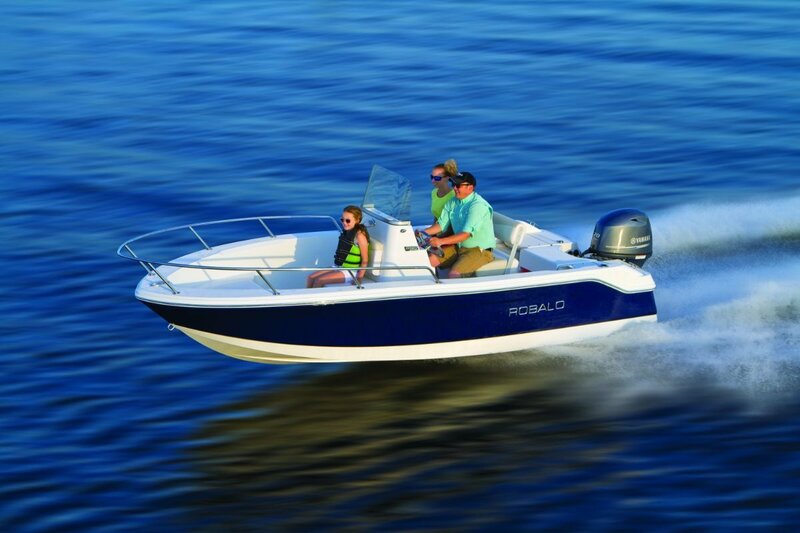 ROBALO have been building quality boats in the USA for more than 45 years. They have won the USA Marine Industry Award for SERVICE AND CUSTOMER SATISFACTION for the past 7 years in a row! We at Mansfield Marine only believe in supplying boats that serve their owners well. With CARIBBEAN Cruisers and ROBALO C/ Consoles we have what you need. The R160 redefines what you can expect in a 5 mtr center console, they make buying new a pure pleasure with a sea of choices. Many options are available to make this rig suit your needs, right down to the 15 colour combinations available. Under the gelcoat you'll enjoy classic Robalo quality through and through. Same durable Kevlar construction as her big sister center consoles, flotation foam filled to keep it up right and level if swamped and a Limited 10 year hull warranty. Same high quality stainless steel hardware, same top tier vinyl and rich foam padding, same precise attention to detail. It might be the smallest center console in the Robalo range, but it's big on quality, bigger on performance and super-sized when it comes to family fun on the water. Best of all it's a Robalo through and through, no short cuts here. None. The best way to describe this package is EASY! Easy to Operate. Easy to Trailer. Easy to Own. Easy to Service. Easy to Afford! Starting from $49500 on a trailer! ORDER NOW. You can choose from 50hp for a safe estuary cruiser or up to 90hp to pull a skier or tube all day. T/top, or bimini cover options available. Anything you need, we can get it onto the boat for you! Start at the bow, work your way aft and you'll discover 5 mtrs or boat jam packed with fishing features, Robalo quality, clever innovations and an efficient use of space. Twin casting platforms make it easy to put hooks in the water, deep interior freeboard renders a dry, safe and secure feeling. The R160 is well appointed with a huge fish locker forward, sure footed interior non-skid, stainless steel hardware and cockpit courtesy lighting. A reversible helm seat adds to the versatility of the boat's six person passenger capacity. Extended V plane hull surface: Improved performance is a result of the transom being well forward of the hull bottom running surface. Since the engine is bolted to the transom, the boat's center of gravity is effectively further forward which allows it to get on plane more easily and at a lower speed. The longer running surface adds buoyancy aft when the boat is at rest, and it adds planing surface when the boat is running at speed. This extra waterline length also reduces pitching and thereby makes the boat more comfortable out on the water. The boat is also less sensitive to weight shifts aft, such as when a couple of people are standing in the stern to play a fish or handle a towing toy. The transom is composite cored to help eliminate the possibility of rot and de-lamination. But for many what will make this boat especially appealing against the used boats in the same price range will be the 10 year limited boat warranty. The end result allows first time buyers as well as anglers looking for a 16' (4.87 m) center console an opportunity to get into a well built and well-appointed boat at a reasonable cost. We have a R180 and R222 available for inspection and the R160 in stock for immediate delivery! Pricing is subject to change from time to time, but is fixed upon placing of order. If looking for a Console boat, like Sea Fox, Boston Whaler, Trophy, Everglades, Genesis, or you have a Caribbean, Riviera, Bertram, Maritimo cruiser and need the ultimate tender, then you should consider a ROBALO centre console. Your Choice from 50 - 90 hp. Massive inclusions and capability for a minimal price. Order now for summer or you will miss out!